Published by Schiffer Publishing, Ltd., 4880 Lower Valley Road, Atglen, PA 19310. E-mail: Schifferbk@aol.com Web site catalog at: www.schifferbooks.com. Price: $49.95. Large hardback, 256 pages, color photographs throughout. 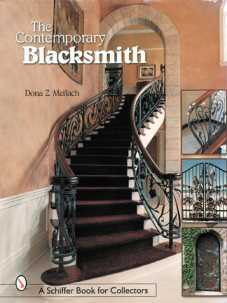 Once again, Dona Z. Meilach tackles the burgeoning revival of the blacksmith's art in an important new book. For The Contemporary Blacksmith, she has brought together over 500 works by nearly 200 artist-craftsmen from 16 countries to illustrate the unprecedented activity in modern ironwork. In this current perspective, she shows how metal work has blossomed into a serious art form over the past 25 years, since the publication of her first classic book on the subject, Decorative & Sculptural Ironwork. Delving into the fascinating historical background of ironwork and designs rooted in art nouveau and art deco styles, Dona shows how the modern movement emerged. She introduces some of the men and women who are fascinated by smithing, and why and how the act of manipulating metal becomes such a powerful muse. You will learn several techniques using hot and cold forming with the results clearly shown. You will be able to recognize how a fence, railing, grille, table, chair, knife, and other items, evolve, and better appreciate their design and workmanship. In each chapter, Dona provides background for the type of objects shown; architectural ironwork, sculpture, furniture, containers and vessels, lighting fixtures and candleholders, fireplace accessories, wind vanes, household and liturgical items, and the incredible knives made of Damascus steel. She has also gathered statements from almost all the artists represented, who could easily inspire you to pick up a hammer and try your hand at this ancient art form gone modern. You will find ample information for how and where to begin in her extensive resource list of organizations, Internet sources, publications, museums, and education opportunities. The Contemporary Blacksmith would be a plus in the libraries of every metalworker, art educator, architect, interior designer, ironware collector, and crafts person.